Warren Mansell and Timothy A. Carey introduce a theory dating back to the 1950s that is increasingly touted as revitalising the behavioural sciences. I The denial of purpose. The study of the inherent purposiveness of humans and other animals is typically seen as unscientific. I Poor specification of behaviour. The denial of purpose leads researchers to focus on observable behaviour. But there is no consensus on what counts as behaviour. Take the example of opening a door. Is it defined in terms of the muscle contractions involved? The movement of the door? Or the person’s judgement of it being ‘open’? And would the door opening due to a gust of wind count? All of these questions seem to be relevant but rarely are they all considered. It is also accepted that behaviour is perplexingly variable and hard to predict, which suggests that our current models are failing (Bell, 2014). I Behaviour is not an endpoint. Even when a reliable aspect of behaviour can be measured, the idea that it follows a ‘stimulus’ or ‘trigger’ in the environment predominates. Yet, behaviour is part of a two-way process. This insight was known in the 19th century, but appears to have been lost – ‘the motor response determines the stimulus just as truly as the sensory stimulus determines the movement’ (Dewey, 1896; p.363). I The mechanism of control is not understood. Psychologists are aware that it is important to study control (e.g. locus of control, attentional control, affect control, mental control, loss of control). However, there is little work in psychology on how control works. Marken proposes that when one combines these flaws, we are left with a century of research that tells us very little. Marken claims that perceptual control theory (PCT) provides the antidote. Could PCT really provide a scientific revolution, or are we witnessing an attempt to build a cult-like allegiance to a radical, but ultimately hollow, idea? Marken’s proposed approach has its origins in a simple process – homeostasis. Building on early work in the 19th century by Claude Bernard, Walter Cannon described a model of how important physiological variables in the body (e.g. temperature, blood sugar levels) are kept at optimum levels. The optimum level is set inside the organism, as a reference value. A process known as negative feedback keeps the actual levels from deviating too far from an optimum level specified by the organism itself. So, for example, as blood glucose levels go below the optimum level, an error signal is generated by a comparator function. This leads to the conversion of more glucose from glycogen stores to raise the level back to the optimum. This process continues dynamically rather than in a step-like sequence. This means that the error signal is being changed by the glucose levels at the same time as the glucose levels are being changed by the error signal; that is, all variables are changing simultaneously. The result is that the error signal ‘brings itself’ to zero and maintains the physiological variable at the reference value. This principle is at odds with the traditional approach of stimulus and response. If a person ingests a sugary meal, this is not a ‘stimulus’ that causes the ‘response’ of glucose reduction or production, but a disturbance to the variable controlled by homeostasis (glucose level). William T. Powers, a control engineer, had worked closely with negative feedback devices during and after World War II. During the 1940s a movement known as cybernetics used principles of negative feedback to understand the behaviour of living organisms. However, on reading their work, Powers realised that he needed to apply the ideas in a different way to account for the observation that behaviour is part of a process of control (Powers et al., 1960a, b; Powers, 1973). People experience consistent outcomes – e.g., they open a jar or a have a sip of beer – in the face of unpredictable (and often undetectable) and varying environmental disturbances – such as the varying tightness of different jar covers or the varying amount of beer in the glass. Powers realised that in order to maintain this consistency, an organism would need the ability to perceive the results of its actions and compare them to a reference value in a continuous, ongoing manner. The core component of PCT is the closed loop (see Figure 1). It describes a series of connected functions that are designed to maintain important perceptual variables within the organism close to their reference values. A simple perceptual variable might be light intensity. Thisis analogous to a physiological variable controlled by homeostasis, except of course the actions of the organism impact on the outside environment. Key features of the environment become the means – the feedback functions – through which each individual maintains desired reference values. When anything from the environment disturbs the desired state(s), the individual strives to counteract these effects. Also, perceptual variables, such as light intensity, are controlled by varying actions, not by a specific stimulus–response pathway. For example, the iris muscles control light intensity, but we can use a range of other behaviours to control light intensity – turning our eyes away, turning our heads, moving into the shade, or wearing designer sunglasses! All serve the same purpose, as well as potentially serving a range of other purposes (e.g. to stay cool; to ‘look cool’!). This example shows that it is more reliable to study the perceptual outcomes of behaviour, in this case light intensity, than it is to study behaviour itself. This ultimately entails that the individual controls a wealth of perceptual variables through its actions, and the concept of a ‘stimulus’ loses its meaning. There are only aspects of the environment that help people to control their perceptions, or those that disturb that capacity; the causal flow comes from within the organism, not from outside it. 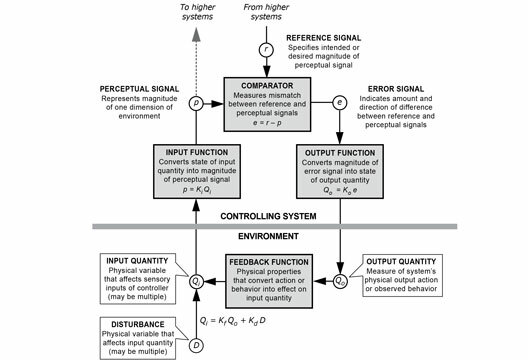 Hypothesis 1: If perceptual input can be controlled at a fixed value through dynamic action then, in contrast to the stimulus–compute–response model, there will be no reliable statistical relationship between input and output. Hypothesis 2: Which perceptual variable is being controlled can be discovered by disturbing the perceptual input in various ways and observing which actions are produced (test of the controlled variable). Hypothesis 3: Computer models based on PCT can be constructed that match the behaviour of a particular individual engaging in a real-world task. Evidence in support of these hypotheses could turn around the way that psychology is studied by remedying the flaws of our longstanding approach. Powers first published studies using a tracking task in Psychological Review (Powers, 1978). Participants used a joystick to keep a cursor in a desired perceptual state (e.g. to keep the cursor location constant; to move it at a certain speed) on the screen, while the computer applied random disturbances to the cursor that disrupt its movement. Participants clearly had a goal, yet it was inferred by the computer through the following correlations. First, in support of Hypothesis 1, and contrary to the stimulus–compute–response model, there was typically little correlation between participants’ input (i.e. cursor position) and output (i.e. joystick movements). econd, supporting Hypothesis 2, the perceptual variable that participants were controlling could be identified by the high correlation between a disturbance (i.e. the computer moving the cursor) and their actions against it. In short, Powers had found a way to work out a person’s goals through an experimental method. Marken replicated these findings with different perceptual variables such as two-dimensional location and relative distance (e.g. Marken, 1986). Moreover, Marken also constructed computer models that showed extremely high correlations with participants’ behaviour – supporting Hypothesis 3. Indeed, a further step shows that the computer models work in the real world – by producing robots that manage simple skills (see www.perceptualrobots.com). One criticism of these studies is that they might not be relevant to everyday behaviour. Therefore, Marken applied the theory more widely. For example, he constructed a model based on PCT to simulate how baseball fielders move on the pitch so as to be in the correct location to catch flyballs (Marken, 2005). The model controlled two perceptions – the lateral displacement of the ball on the retina from a central point, and the velocity of the ball on the retina as it moved (see www.mindreadings.com). The model worked despite having no internal model of the physics of ball movement, and it made no predictions about the likely path of the ball. Marken has also applied the methodology to work out a person’s intentions (a key element of judging theory of mind), and also to estimating errors in medical prescribing. A truly revolutionary theory should also question longstanding scientific findings. Jeffrey Vancouver at Ohio University applied PCT to challenge the established view that self-efficacy leads to improved performance (Bandura & Locke, 2003). Vancouver found a number of issues with earlier studies including that they were often cross-sectional and so the reverse effect could be occurring: good performance leading to enhanced self-efficacy. PCT predicts that the efficient correction of errors is essential for control. Therefore, enhanced self-efficacy could lead to poorer performance if it entails people being less attentive to their errors. In a prospective study in which self-efficacy was manipulated, this effect on performance at an analytic game was observed, and has been replicated (e.g. Vancouver et al., 2002, 2014). A wholly new perspective should also shed light on earlier findings. One classic example is the ‘extinction burst’ in learning studies, whereby animals increase their responses for rewards as soon as the rewards are removed, which is not predicted by behavioural theories that propose that rewards reinforce behaviour. Yet, PCT does predict this effect because the greater error between actual and expected reward drives greater action(s) to try to maintain the previous rate of reward. Within experimental psychology, Marken (2013) used ‘control theory glasses’ to re-examine a familiar laboratory experiment: measuring how long it took participants to discriminate the colour of a perceptual stimulus. The PCT model simulated the task as the participant purposively used the movement of a cursor as one method to apply the perceptual rule of whether the colour was perceived as present or absent. The PCT model showed a better fit with participant data than a stimulus–compute–response model when a disturbance was applied to the cursor. If PCT genuinely provides a revolutionary take on behaviour, it should also apply to a wide range of disciplines that involve models of behaviour (Carey et al., 2014a; Marken & Mansell, 2013). At the University of Lethbridge, Sergio Pellis and Heather Bell studied animals’ attempts to rob food from other animals (the ‘dodgers’) in two very different species – rats and cockroaches. They coded videos of the animals’ movement frame-by-frame and showed that the ‘dodger’ animal maintained a minimum distance from the robber – the controlled perception – using dynamic variations in behaviour. They constructed a computer simulation of animal ‘agents’ based on PCT that replicated the same pattern of observations (Bell, 2014). Furthermore, a diverse range of animal behaviours fit the same account (Barrett, 2011). The neurophysiological underpinnings of perceptual control are also being explored. Following years of research on the function of the basal ganglia, Henry Yin at Duke University presented a model based on PCT (Yin, 2014). The model proposes that the basal ganglia control the rate of change in kinaesthetic perceptual variables, such as movement velocity. PCT has also formed the basis of two influential theories in sociology – affect control theory and identity control theory. Kent McClelland at Grinnell College, Iowa, is using PCT to build working models of social systems that replicate well-known sociological observations. These model the conditions and obstacles to collective control – where individuals work together to try to achieve the same perceptions. One recent example produced a detailed simulation of violent conflict escalation in social groups (McClelland, 2014). What about ‘complex’ psychological processes? Powers et al. (1960a, 1960b) produced a working architecture for PCT in which the negative feedback loop is just a simple building block. The loops are organised in a hierarchy in which each reference value comes from the outputs of a control unit that is ‘above’ it, which in turn receives its reference value from the level above it. In this way, more complex perceptions (e.g. ‘to win a tennis match’) are achieved – not directly through action – but by setting the various perceptions to be experienced by the next level down (e.g. ‘to keep the ball in the court’, ‘to direct a shot away from the opponent’). Such a hierarchical organisation provides the potential for sophisticated control. Recent work has supported this model by showing that the delays found in complex motor behaviour can be accounted for by the fact that more complex perceptions (e.g. detecting a change in transition from objects getting larger to getting smaller) take longer to control, even when they are indicated by the same motor response (Marken et al., 2013). With such a complex network of perceptual goals, there is the potential for conflict – that is, two or more goals may compete with one another to pull perceptions in opposite directions. A classic example might be a child’s distance from their source of safety (goal 1: stay safe) as they move around their environment (goal 2: explore). Recall that control units receive their reference values from a superordinate system. So, the higher-level system needs to change the way that it regulates the subordinate conflicted systems. This is thought to occur through a process known as reorganisation (Powers et al., 1960a, 1960b) - that operates through a specific search algorithm (Powers, 2008). Reorganisation alters the functions of the higher-level system in a trial-and-error way until control is restored; it also accounts for how control systems are ‘tuned’ to control effectively. In the example above then, the child might strike a balance between safety and exploration. Another feature of the architecture is that past perceptions are stored locally as memories within each control unit. Therefore, they can be used either as references for current action, or in the absence of an opportunity in the environment, they can be rerouted internally ‘as if’ that perception is occurring – known as the ‘imagination mode’. This enables the internal control of perception – that is, planning, expectation and mental imagery. Thus, PCT includes a means to simulate future perceptual outcomes even though this is not the fundamental nature of its architecture. Powers used his architecture to explain psychopathology (Powers et al., 1960a, 1960b) by proposing that unresolved conflict is the cause of the loss of control that is experienced during psychological distress. Therapy should therefore involve helping the client to shift and sustain their awareness on the higher-level control systems driving the conflict, so that reorganisation can restore control (Marken & Carey, in press). Powers developed a questioning technique to achieve this, which has become known as the ‘method of levels’ (MOL: Carey, 2006). MOL can be applied in the same way to a wide range of problems – that is, it is ‘transdiagnostic’. Its flexibility also means that it can be more efficient (i.e. greater effect size per session) than equivalent therapies (Carey et al., 2013). In a recent article Carey et al. (2014b) explained how unresolved perceptual conflict could mediate the effects of trauma on psychosis and other severe mental health problems, and how it could be addressed using MOL. PCT is unique, it has empirical support, and it has the potential to unify diverse fields of science through a ‘control revolution’ (considered in more detail elsewhere, e.g. Mansell et al., in press; Marken, 2014; Runkel, 1990). Uniquely, the revolution would involve characterising living organisms by their control of perceptual variables. Rather than attempting to predict behaviour, the new science would attempt to identify controlled variables. For example, we are using the methodology to infer the preferred interpersonal distances of two individuals during a conversation, and the preferred distance from a feared animal in a ‘virtual corridor’. Future work could explore the control of ‘higher-order‘ perceptions, such as self-concept (Robertson et al., 1999). This work requires an experimental set-up where: (a) the environment contains elements that are relevant to the purposes of the participants; (b) the environment can be constrained sufficiently to manipulate disturbances or quantify natural disturbances, and (c) quantitative measures can be taken relatively implicitly so that the measurement process does not become a disturbance itself. This approach would provide the basis for developing and testing increasingly sophisticated computer models and robotic devices that control the same perceptual variables. Further advances would identify the components of the PCT architecture, such as examining how each layer of the perceptual hierarchy constructs perceptions from the level below. Finally, given the unifying nature of PCT, the approach would genuinely embrace interdisciplinary working. (e.g. Bandura & Locke, 2003), which have largely been addressed elsewhere (e.g. Taylor, 1999; Vancouver, 2005). The recent upsurge in high-quality research and applications involving PCT indicates that Marken may have been right in suggesting that PCT will usher in a psychology revolution that is long overdue. Only time will tell whether the potential is fully exploited, and the ‘tipping point’ occurs. Bandura, A. & Locke, E.A. (2003). Negative self-efficacy and goal effects revisited. Journal of Applied Psychology, 88, 87–99. Barrett, L. (2011). Beyond the brain. Princeton, NJ: Princeton University Press. Bell, H.C. (2014). Behavioral variability in the service of constancy. International Journal of Comparative Psychology, 27, 338–360. Carey, T.A. (2006). Method of levels. Hayward, CA: Living Control Systems Publishing. Carey, T.A., Mansell, W. & Tai, S.J. (2014a). A biopsychosocial model based on negative feedback and control. Frontiers in Human Neuroscience, 8, 94. Carey, T.A., Mansell, W., Tai, S.J. & Turkington, D. (2014b). Conflicted control systems: The neural architecture of trauma. The Lancet Psychiatry, 1, 316–318. Carey, T.A., Tai, S.J. & Stiles, W.M. (2013). Effective and efficient. Professional Psychology: Research and Practice, 44, 405–414. Dewey, J. (1896). The reflex arc concept in psychology. Psychological Review, 3, 357. Mansell, W., Carey, T.A. & Tai, S.J. (2015). Classification of psychopathology and unifying theory. Psychopathology Review, 2, 129–153. Marken, R.S. (1986). Perceptual organisation of behavior. Journal of Experimental Psychology: Human Perception and Performance, 2, 267–276. Marken, R.S. (2005). Optical trajectories and the informational basis of fly ball catching. Journal of Experimental Psychology, 31, 330–634. Marken, R.S. (2009). You say you had a revolution: Methodological foundations of closed-loop psychology. Review of General Psychology, 13, 137–145. Marken, R.S. (2013). Taking purpose into account in experimental psychology. Psychological reports, 112, 184–201. Marken, R.S. (2014). Doing research on purpose. Chapel Hill, NC: New View Publications. Marken, R.S. & Carey, T.A. (in press). Understanding the change process involved in solving psychological problems. Clinical Psychology & Psychotherapy. Marken, R.S. & Mansell, W. (2013). Perceptual control as a unifying concept in psychology. Review of General Psychology, 17, 190–195. Marken, R.S., Mansell, W. & Khatib, Z. (2013). Motor control as the control of perception. Perceptual and Motor Skills, 117, 236–247. McClelland, K. (2014). Cycles of conflict. Sociological Theory, 32, 100–127. Powers, W.T. (1973). Behavior: The control of perception. New York: Hawthorne. Powers, W.T. (1978) Quantitative analysis of purposive systems. Psychological Review, 85, 417–435. Powers, W.T. (2008). Living control systems III: The fact of control. New Caan, CT: Benchmark Publications. Powers, W.T., Clark, R.K. & McFarland, R.L. (1960a). A general feedback theory of human behaviour. Part I. Perceptual and Motor Skills, 11, 71–88. Powers, W.T., Clark, R.K. & McFarland, R.L. (1960b). A general feedback theory of human behaviour. Part II. Perceptual and Motor Skills, 11, 309–323. Robertson, R.J., Goldstein, D.M., Mermel, M. & Musgrave, M. (1999). Testing the self as a control system. International Journal of Human-Computer Studies, 50, 571–580. Runkel, P.J. (1990). Casting nets and testing specimens: Two grand methods of psychology. New York: Praeger. Taylor, M.M. (1999). Editorial: Perceptual control theory and its application. International Journal of Human Computer Studies, 50, 433–444. Vancouver, J.B. (2005). The depth of history and explanation as benefit and bane for psychological control theories. Journal of Applied Psychology, 90, 38–52. Vancouver, J.B., Gullekson, N.L., Morse, B.J. & Warren, M.A. (2014). Finding a between-person negative effect of self-efficacy on performance: Not just a within-person effect anymore. Human Performance, 27, 243–261. Vancouver, J.B., Thompson, C.M., Tischner, E.C. & Putka, D.J. (2002). Two studies examining the negative effect of self-efficacy on performance. Journal of Applied Psychology, 87, 506–516. Yin, H.H. (2014). Action, time and the basal ganglia. Philosophical Transactions of the Royal Society B: Biological Sciences, 369(1637), 20120473.